Because we love heavy metal! 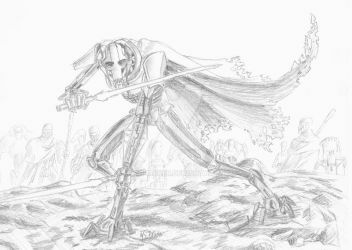 General Grievous. Supreme Commander of the droid army and a warlord of the Kaleesh. Due to his cybernetic body, he's able to hold up to five lightsabers at once. He has claimed the lives of several Jedi and keeps their lightsabers as trophies. Welcome to his fan club. Welcome to GG-x-Lovers, a fan group dedicated to the fearsome cyborg General Grievous from Star Wars! Please make sure the picture you are submitting is not a 5 second doodle. Sketches are okay, but not the doodles you drew in your school notebook. Your deviation must include General Grievous in some way; this is a fan group for him after all! The only exception is for the Kaleesh folder, where other members of the Kaleesh race are welcome, but they should still have some direct tie to Grievous. Be kind to one another! While we may be brought together by our mutual adoration for the good General, we all come from different walks of life and backgrounds, so be respectful of one another. When you've chosen the picture you want to submit, click on "Gallery" at the top of the page, find the folder that your art would fit best in, scroll to the right of the title bar and click on the "+" button. You normally have to be a member of the group in order to submit a deviation, though the group will also request for awesome pieces of works to be included if we find them. At this time, suggestions to the 'favorites' tab are not allowed, as they are currently used for the winners of past contests. Now, what are you waiting for? Click "JOIN THIS GROUP" and spread the word about us! (Reader/Grievous) Memories of You: Ch. 3Genre: Romance/Hurt(/Comfort)/Slice-of-Life? Summary: Your life has been a rocky one. Taken from your home as a child, passed around as a servant, but eventually taken in on the planet of Kalee, though you quickly came to know it as 'home'. You became the mate to two of the strongest warriors of the planet, but after they both perish, you're once more alone and on a new planet hoping to live the rest of your years running from your broken heart. But when you're captured by the Separatists and confronted by General Grievous himself, you find yourself wondering if the assumed death of one lover had actually been a lie. War had always been inevitable. Whether one was on one side of the line or the other, the writing was as clear as crystal: the tension between the Republic and the Confederacy of Independent Systems would always end in war and bloodshed. Summary: Fate doesn't always lead you with a single, paved road of asphalt leading in one clear direction. Sometimes fate is a path of challenge and turmoil; uncharted trails that travel somewhere dark and fearful. Sometimes those paths were carved, carelessly so, by those who came before us. We are sometimes left to deal with the rough road of which we had no choice, if only to find our place in the universe. This is the rocky, dirt road of Sakajin Aditu Takio, a young woman who finds herself twisted in the fate her mother left behind long after disappearing from her life. When Sakajin is taken in as a mechanic and later the unwilling apprentice of General Grievous, she finds herself learning the ugly consequences of war, the pain of loss, and the worth of protecting those she cares for. (Reader/Grievous) Memories of You: Ch. 2Genre: Romance/Hurt(/Comfort)/Slice-of-Life? Summary: Your life has been a rocky one. Taken from your home as a child, passed around as a servant, but eventually taken in on the planet of Kalee, though you quickly came to know it as 'home'. You became the mate to two of the strongest warriors of the planet, but after they both perish, you're once more alone and on a new planet hoping to live the rest of your years running from your broken heart. But when you're captured by the Separatists and confronted by General Grievous himself, you find yourself wondering if the assumed death of one had actually been a lie. (Reader/Grievous) Memories of You: Ch. 1Genre: Romance/Hurt(/Comfort)/Slice-of-Life? Voting is CLOSED now. I'll count up the votes and announce the winners soon! I... I am SO sorry that this has taken so long to get posted. I apologize to the contestants and the members who've been waiting so long to vote and be voted for (whichever the case). Real life duties have kept me away. Plain and simple. And then when I did have time to get on DA, I meant to update this, and then forgot. I'll do better next time. By the cyborg general, I will do better! So, all in all, thanks for being patient with me. Now, on with it! It's time now to vote for the winners of our "Grievous Team-Up" contest. We had some seriously awesome entries this time! And this contest also celebrated the return of long-time GG-x-Lovers member (and contest participant) ! The goal was to show Grievous being teamed up with another character and wow did you guys deliver on that concept! I wish all of you the best of luck! Or, if you'd rather... May the Force be with you - Jedi scum! This tells me your preference for who should be first, second and third. Each time a submission is chosen as #1, it gets 3 points. #2 gets 2 points and #3 gets 1 point. These points aren't the dA currency points, by the way. Oh, by the way, please don't vote for yourself. Whichever three deviations get the most amount of points are the winners. The submissions will be favorited by the group, and the winners will get their art prizes. I'll send a note to everyone who wins and the people who donated prizes so everyone knows who won what. Good luck, everybody! To view the gallery folder, click HERE. - Until next time, Jedi scum! Our footer image was provided by suzidragonlady and used with permission. Animated effect added by Nala15. Also, if you join be sure you put the club icon in your journal to help spread the word! To submit art to the club, just go into the gallery and click the button that says, "Submit art to this Gallery". We do not accept official images here at the club. All submissions must have been made entirely by you yourself. BUT we will accept SOME wallpaper collages (but we'll be picky!). We do not accept pornographic images or anything extremely gross. Let's try to keep this place classy, y'all! You're OCs may be accepted if the picture has Grievous either drawn to share an equal or greater amount of the page with your character. Acceptance is debatable. If you have any questions, note the group or Nala15. Very good group of followers of the excellent Gral Grievous. OK!WHO IN THE UNIVERSE PUT MY DRAWING JEDI SCUM COUGH COUGH ON GOOGLE?!?!!?!?!??!? Any of you watched Belated Media's What If the Star Wars Prequels Were Good videos? If not, you'd better check them out (in numerical order so you'd get the gist of everything). You might really like how What If Episode III does Grievous! Hi don't want to come off as a spammer, but just trying to spread word that Simon Pegg who is officially involved with The Force Awakens recently insulted George Lucas and more than half the Star Wars fanbase. Just trying to get word out about a petition requesting his removal from Official Star Wars projects. It's time that Prequel Fans stand up for their part of the Franchise. I have no problem with people expressing their views, but someone who is officially involved with the Star Wars franchise shouldn't be dissing it's creator and more than half it's fanbase. Hey, I was wondering if one of you could help me answer this question involving Grievous. I would like to use your opinion to build his character for my multi-crossover "The Other Side". In all of my fanfictions of him, the only thing that made him cry was his memories. He was always remembering his past and that caused him to break down. I am now looking to do the opposite. In my crossover series, Grievous is being plagued by the memory of almost dying in the Jenuwaa Sea. He consults a wizard and the latter gives him a potion to forget about that particular memory. After said wizard decides to secretly hex the potion, Grievous soon forgets his past memories and his body forgets to function with his cybernetics. Do you think being in pain and forgetting the proud warrior he once was would be enough to make Grievous cry? I just wanted to know. Thanks! I think so, from what I've seen, he's a very proud character. Anything that could make him feel like he had lost his reason for pride would probably be enough to get him emotional. Hope that helps. That's a pretty good explanation. Thank you!